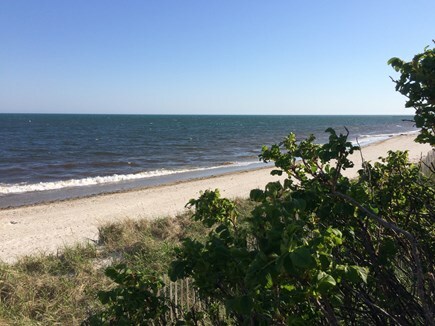 Stroll barefoot 160 feet across grass and gardens to your beautiful expansive 500 foot, private, soft white sandy beach on warm Nantucket Sound ocean waters. 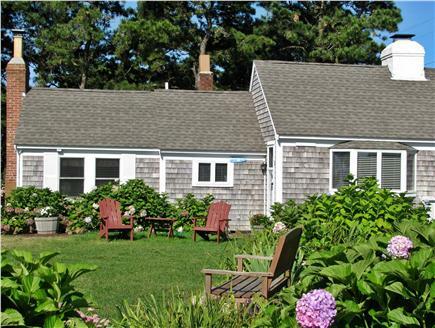 This clean romantic cottage is in a private oceanfront cottage community surrounded by lawn and gardens. 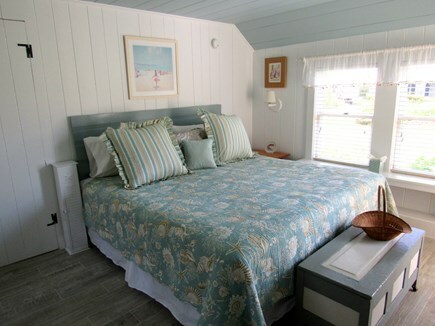 Enjoy the convenience of everything you need for relaxing beach living in your cottage by the sea. Cottage features a cathedral-ceilinged, great room with floor-to-ceiling fireplace. Charming, ocean view bedroom with king-size bed, its own romantic fireplace and reading alcove. Ocean view, well equipped brand new kitchen with full-sized appliances and utensils. Tables and chairs outside for relaxation, lunch and late evening romantic outdoor dinners. Brick charcoal grill. Relax on lounge chairs by the grass border overlooking the 500 foot beach. Surfcast from the jetty. Use the fresh-water outdoor shower overlooking the beach to rinse off salt and sand. 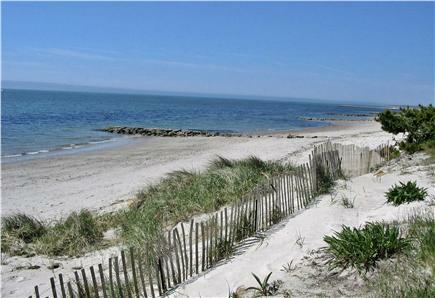 Walk the mile-long beachfront to Bass River light and pier to watch the boats and fishermen. Entire cottage remodeled and painted. New floors, new lighting, new bathroom, new kitchen 2017. Housekeeping & linens are included. Playground with swings, climbing gym, shaded gazebo etc. a short beach walk from the cottage. Plenty of closet storage space and bookshelves in the main room and master bedroom. Surrounded by gardens and grass perfect for play areas, lounging or eating outside. Off the main roads, yet easily accessible to shopping, recreation and restaurants. 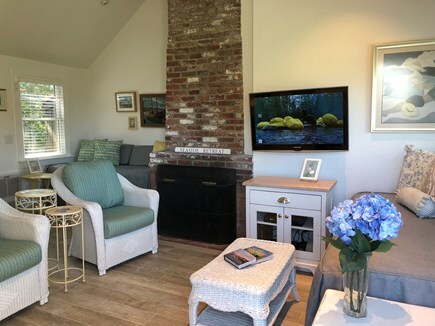 In the cottage you'll find maps and our own personal detailed Cape Cod Guide with information including directions and phone numbers with activities for kids and adults including restaurants, museums, destinations and walks. Widescreen 4K HDTV on swing arm for optimal viewing, plus HD DVR and BLU-RAY DVD player. Cottage Wi-Fi. Bose bluetooth wireless speaker system for your music. All living room LEDs, kitchen LEDs and bathroom lights are on dimmer controls for perfect lighting for dinner, reading or TV/movie watching. Additional availability info: SAT-SAT summer Fall rentals after Labor Day are SUN-SUN. This is a Saturday to Saturday vacation rental. Additional pricing info: 11.7% state & local tax, State and local taxes of 14.45% will apply. This cottage on the water exceeded our expectations complete. The spacious rooms are beautifully decorated and immaculate--truly 5 star accommodations. 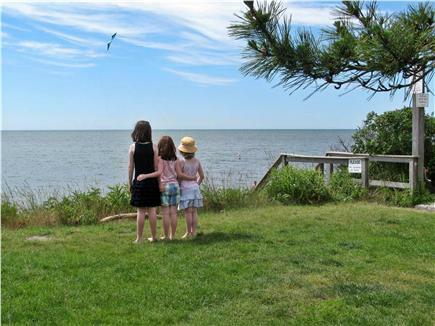 Beautiful views of the ocean from the cottage, with premium private beach access. 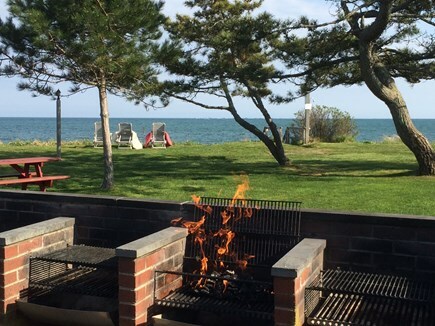 Outdoor grills and picnic tables with beach views make meals easy and enjoyable. Surrounded by beautiful gardens, and short walk to playground, ice cream, other activities. We can't wait to bring our family back again next year. Highly recommended! We spent the last week in June at Sharon & Phil's cottage by the sea and had a fabulous time. 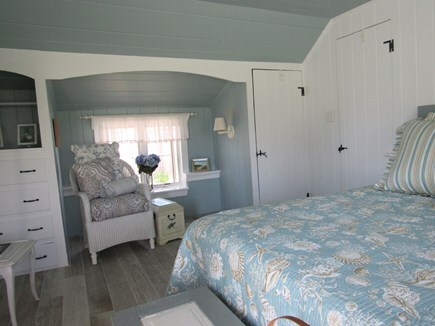 It was hard to leave this charming, quaint, and completely updated Seaside Cottage. Nestled among a group of cottages, this beautiful home stood out above the rest. Meticulously updated decor and personal touches throughout make this cottage a wonderful place to enjoy the beauty of Cape Cod. The updated kitchen, bathroom and beautiful wood look tile floors throughout, make you feel like you are in a 5 star hotel! No detail was forgotten and the cottage included everything we could possibly need during our stay. Enjoy daily maid service including fresh towels and soaps. Perfect for a family of 4 or less. The cottages are family friendly. The central courtyard area provides a place to mingle with other guests/families if you so desire. 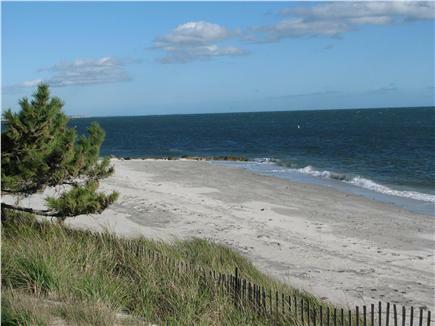 Centrally located, it was easy to visit Martha's Vineyard, Nantucket, National Seashore, Boston, Salem and the Upper Cape. The private beach allows for frequent ocean dips throughout the day. The owners provide a personal touch from beginning to end, including a wonderful guide to attractions and restaurants. All of their suggestions were "top notch" and greatly enhanced our trip. The owners were readily available to answer any questions or provide suggestions. The cottages in this plan are not air conditioned, so be prepared. The owner disclosed this and their cottage is fully equipped with fans to cool off the unit in case of warm or humid weather. Glad you enjoyed your week, our Cape Guide attractions and our new high-tech Haiku high capacity quiet ceiling fan along with the other fans! This is our second summer staying in this great cottage, and this year was better than the last! The beach was great, private and beautiful. The cottage has been totally renovated and looks amazing. Thank you to the owners for letting us come back! Looking forward to next year. A slice of heaven on the pristine, warm ocean! What an AMAZING vacation week we had at the Wilson Cottage!! We thoroughly enjoyed our time at Seaside, and the Wilson's home is just so beautiful. What a special space in a special place! The water was so warm, and the sand was soft and clean! We even noticed that the staff enforced the "private beach" sign if there was anyone who seemed to be camping out on the private stretch. I've been with my husband for 6 years, and this is the first time I actually saw him go swimming in the ocean. He was so happy and care-free jumping in the waves. He and our son were in the water every single day for at least 2 hours. Because we were RIGHT on the water, we went to the beach at least twice. We don't have a yard at home, so we LOVED playing with his outdoor toys on the lawn right outside our door. In the afternoon heat, we turned on the hose and played with his water toys and sorted seashells under the shade tree. The other guests were just as pleasant as pie...super-friendly, and we were comfortable and happy the whole time. The cottage was so clean and offered everything we needed. I sorta wish there was a washer/dryer at Seaside to use, but we washed our bathing suits and hung them to dry on the line...and everything was great! I loved the daily room cleaning and towel exchange, and we loved using the non-stick so much that we bought a set for us AND a set for my parents when we got home. All the details that were put into the renovations were beautiful. Thanks so much for the review. It's helpful to others when you describe just how your family enjoyed the various features as you did. Besides the towel, etc. service, you can also send out any laundry for cleaning. Just to clarify. No cottages in the area are timeshares. They are all individually 100% owned condominiums where the association takes care of housekeeping, the gardens, grounds and beach. 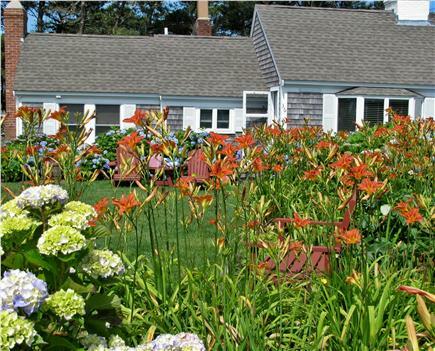 When you walk onto the grounds and see the green well-manicured lawn, the bright blue sea and sky, and the picturesque cottages reminiscent of Old Cape Cod, you feel the weight of the world falling from your shoulders. This cottage is beautifully furnished - if you owned a beachfront property, this is how you would like it to look. 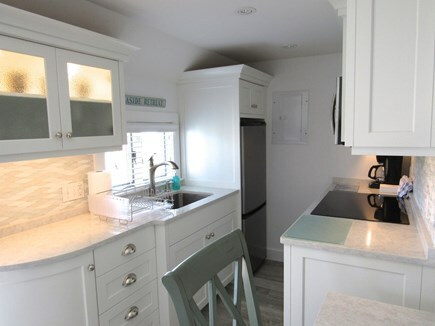 The owners have outfitted the cottage with everything needed for the comfort of the guests, and the condition of the cottage itself, furnishings and appliances is pristine. The location is convenient to restaurants and shopping - we love the Great Island Bakery just down the street which has everything from pies, brea and pastries to dinner casseroles. We have recommended this property many times over the years to friends and family. 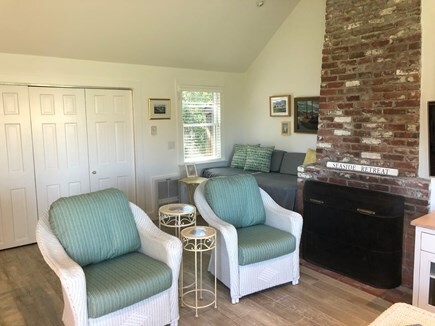 If you are looking for a home base from which to explore the Cape, meet friendly people who are also staying at Seaside, or just sitting and relaxing at the ocean, then this is the spot for you. My wife and I can't say enough fantastic things about this property. Sharon was quite accommodating and kept in touch before and during our stay to make sure everything was as to our liking. Our boys, 12 and 14, loved the place. They spent hours beach combing, swimming and generally getting along (for those of you with kids of this age, you know exactly what I'm talking about). Local activities like kayaking on swam river, fishing excursions and being so close to local attractions like the chatham fish pier made this cottage the ultimate place to vacation. Topped with the local cuisine and history of the cape, and the cottage, we would highly recommend this property for families of all ages. We can't say enough great things about Sharon and our new found friend Pablo! Every year my family looks forward to stay at the cottage for summer vacation. We have been staying here for 13 years. The cottage is immaculate and in my opinion the best cottage at Seaside. The cottage has everything you need to feel at home, king size bed, full refrigerator, HD TV. Each year we've been here, there is something new and improved with the cottage, whether it's a new TV, new windows, new stove, it's always improving, so much so that it really feels like home. The grounds outside the cottage are always well kept and provide a great place to relax and let the kids run around. The beach is just a few steps away and it's private so you aren't sitting right on top of one another like the public beaches. Even the beach is well maintained by raking up loose seaweed. The ocean water temperature on this side of the cape is also much warmer so it's easy to jump right in and enjoy a good swim. Staying in South Yarmouth is also great as there are many activities within a couple miles including Pirates Cove miniature golf, and Skull Island arcade, driving range, baseball cages, and I haven't even mentioned the bakeries and great restaurants nearby. 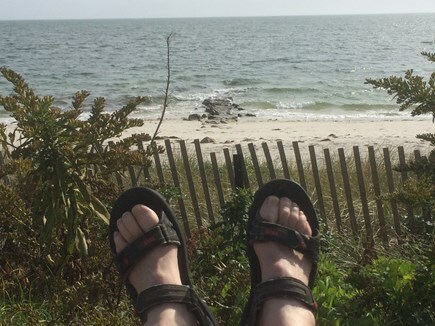 As I've said this is the perfect spot on the Cape for a great relaxing vacation no matter what you enjoy, sitting and reading, water sports, dining, cooking on the grill - it has everything and the best cottage of all! Excellent cottage like a five-star hotel located right on the beach. This Cottage is in pristine condition with ocean views. 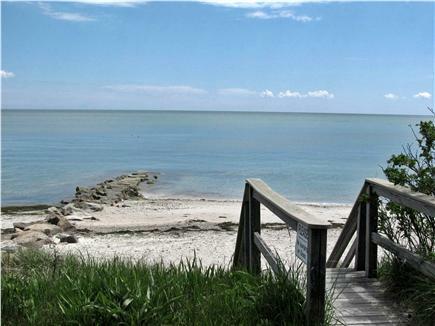 Located in walking distance to a children's park, restaurant, local beachside burgers and ice cream, restaurants, jet skiing, and short drive to many attractive locations on Cape Cod. We love the outdoor barbecue, picnic table areas for eating outside. Quiet cottage community with the opportunity to meet others. We highly recommend this cottage and will be back! Our family vacationed in the area since 1960. We bought the cottage in 1985, remodeled it in 1991. Just finished remodeling the entire cottage again 25 years later in 2018. All new flooring, new LED lights, new kitchen, new bathroom, new 4K TV. We use our ocean cottage off season, in May and in late October when we close for the year. Finished a total cottage remodeling in 2018. Our family uses the cottage off season, so it has all the amenities and comfort an owner would want as opposed to simply being a rental property. 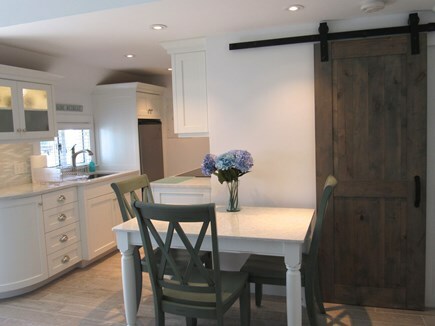 It has the largest closet space of any cottage in the area and is the newest inside. Comfortable bedding. Forget something when enjoying the beach? Just a quick stroll back across the lawn to your cottage. No worry or hassle. Centrally located in Mid-Cape near all summer attractions including day trips to the islands or the Cape Cod National Seashore. Equidistant to all attractions from Plymouth Plantation to Provincetown. Restaurant back across the street 150 yards away with an outdoor ice cream shop. Childrens' playground just a little over 150 yards away.